EA didn't invent the freemium city-builder, but what it did do was balance it so that gamers could play the game without constantly resenting the way that it seeks to pry open your wallet. 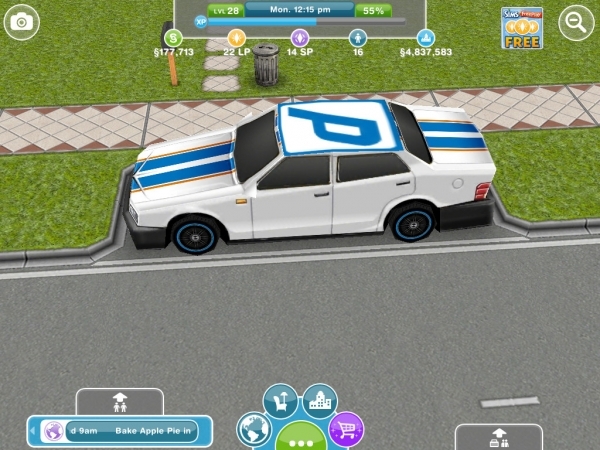 The Sims: FreePlay may be the perfect example of how to do the Freemium City-Building Grinder right. It doesn't have a turn-based brake installed so you never find yourself facing the need to either pay for more turns, or bug your mates to "send" you more via social networking sites like Facebook. What it does, in simple terms, is provide a base game that anyone can enjoy playing, and then add in premium objects via its in-game store that are purely optional. Players who want them will buy them, and players who don't will not find themselves facing an inability to play. In place of that very annoying tactic, the wizards behind FreePlay instead chose to use time as the leveler. Players who choose to pay to play get to skip long timers and quickly advance their game; players who choose not to pay instead trade their time for advancement. In terms of costs, well, there are none! The download is free, game play is free. That just leaves the two premium based currencies to examine. Each action in the task-based game requires a set amount of time. Those timers can be skipped by spending LP - or Life Points - one of the two premium currency objects in the game that believe it or not can also be earned for free through play (though granted in smaller amounts). Properly called "Lifestyle Points" but more commonly "LP" this is the currency used to skip task timers and speed up play. In addition to purchasing quantities in the in-game store, the player can earn small amounts either randomly as Task rewards, or by completing hobby collections. The second type of premium is "Social Points" or "SP" which can be earned, in small quantities, by completing quests in your neighbor's towns (added via social networking). SP is most commonly used for the purchase of special and high value custom objects for your game - examples of which include the higher quality furnishings and interactive objects. 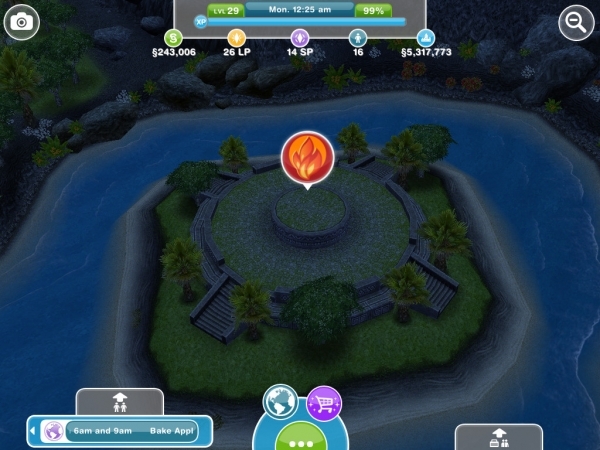 Finally there are two other motivational objects in the game: the Simoleon - the in-game cash - that you are awarded for practically everything you do, and Experience Points (XP), the system for leveling your town. XP is earned, Simoleons can be earned or purchased - and you may find yourself wanting to purchase them because the costs for building and expanding your town grows exponentially with each new building you add! 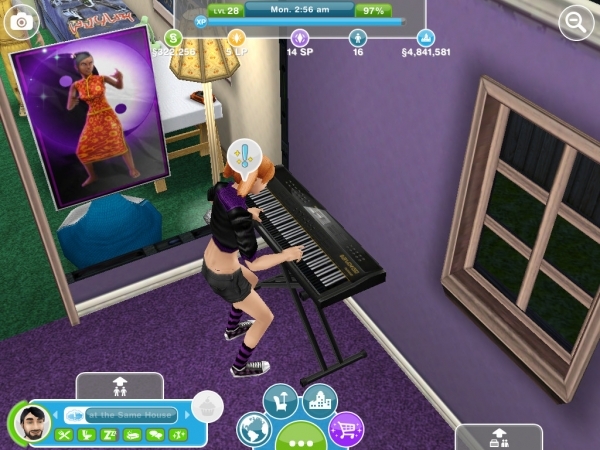 From a perspective of playability and longevity FreePlay sits right at the top of the heap - and not just because it is part of the well-respected and extremely entertaining Sims family! There is so much to do in the game that there is never a point when you will find yourself wondering what your next goal is. The game has a full-time development team and multiple content support teams to ensure that it is constantly being expanded, with new content and missions, new activities, and new goals. 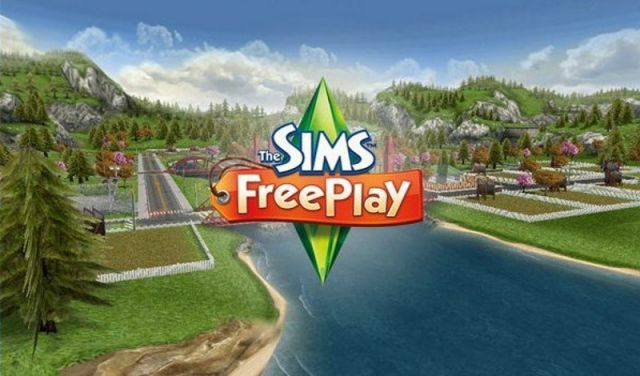 Featuring top-notch graphics that are at once engaging and entertaining, any gamer who has played one of the Sim titles from ANY of the other series will be right at home here, because FreePlay embraces - and matches - the current quality level for graphics and sound. In other words the approach that was taken by the developers was to apply the same level of base quality and experience that they do to all of the other games in the Sim family. Featuring its own rather unique soundtrack, and library of event and special sounds, the game has its own well-established sound character. All things considered, the well-balanced game play permits quality free play, while allowing gamers who prefer to pay to play an equal stake in the entertainment. It should be noted and emphasized that the game is so well balanced that paying to play does not upset the overall entertainment value - and that is saying something! In terms of value for money - and considering that this game is easily played for free - we are hard pressed to point to a better example of a game that should be part of your regular mobile game play rotation. A WORLD OF ADVENTURE IN YOUR POCKET! Follow ..